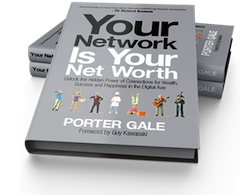 Thursday is guest post day here at Duct Tape Marketing and today’s guest is Porter Gale – author of Your Network is Your Net Worth. Technology has redefined how we prospect for jobs, meet business contacts, and interview. Whereas I got my first job because the receptionist at the courthouse where my mother worked was on maternity leave, today your recruitment involves analysis of your personal profiles on Google, Facebook, and LinkedIn, group lunches, video chats, and other approaches, as well as the formal interview. Every day people are making connections online via Skype, in Google + Hangouts, through email and more. How we meet and network has dramatically changed. The days of getting a job through a series of one-on-one interviews where you wear your blue suit aren’t as common. T. J. Sassani, the CEO and founder of ZOZI.com, shared a story that demonstrates the new model of networking, “One of my most recent hires was a new public relations person named Tian Lee. She found my profile on LinkedIn and sent me an email that was so passionate I realized she could sell the company better than I could. I hired her on the spot.” If you want to accelerate your networking with online tools, seven practical and powerful steps to help you make Your Network Your Net Worth follow. Have a Concrete Goal. Set a networking goal (i.e. seek employment, build friendships), determine your message”and define the types of people you’d like to meet (i.e. at specific companies, industries etc.). Build Your Online Profile. Consider developing a web page. Many open source applications (i.e. WordPress, Magento, spree) and fully hosted website options (SquareSpace, Wix, Virb, WordPress.com) are available. Also try using Facebook, Tumblr, Twitter and other online tools and sites to spread your message. If you’re looking to build your online business profile, do not overlook the power and reach of LinkedIn. If your story or networking goal has a visual component use Instagram and Pinterest to share images, photos and pins that reinforce your message. Know The Blogging Basics. If you’re blogging to build your network or profile, remember attention spans have decreased and multitasking has increased, so keep your content short and concise. Make your headline memorable but not clichéd. Enable social sharing on all posts and post not only on your blog but also on your social media channels. Include your Twitter handle and URL in your byline. Consider blogs with easy-to-digest “top tips” lists or question-and-answer formats. Understand the Power of Keywords & Links. If you do build a site or start generating content, know the power of keywords, the basic principles of search engine optimization and the power of links. What words should you build into your content to reinforce your networking goals and objectives? Are there back links or inbound links that can be added to your site for increased traffic? Have you submitted your website to the major search engines and Internet directories? Share, Connect & Nurture Relationships. If you want to build a relationship with a contact online, it’s important to share, communicate, and connect in the same way that brand fans and companies nurture their relationships. Actions as simple as a retweet (RT) or mention in a #Follow Friday (#FF) list on Twitter, a “like” on Facebook or an endorsement on LinkedIn can signal your interest in connecting. Partner With Publications. When I left my post at VP of Marketing at Virgin America, I made a conscious effort to raise my profile and to build my network by blogging for online publications. I wrote a sample post and pitched several editors. After a quick back-and-forth, two editors agreed that I could blog for them on a regular basis. This is where it gets tricky. I agreed to write content and was not hired as an on-staff writer. So blogging is a bit like sweat equity: you need to make sure you can glean a return in ways that are not directly deposited in your bank account. For me, the exposure kept my name in the forefront, and I included in my bio that I do public speaking. With every post, I gained Twitter followers and usually received a speaking engagement inquiry. So the return on investment wasn’t a direct payment from a publication but came quickly via a larger network and reach and more consulting opportunities. Partnering with or blogging for publications with built-in reach is a faster way to find an audience and build a network than starting from ground zero with your own blog or website. Think Like A Marketer. Get creative with your copy. What is memorable about your email, post or tweet? Are you being clear and direct? Is the subject line header of your email catchy enough to grab someone’s attention? Think creatively, and keep your objective in mind when you use online tools to communicate. A mistake that people often make is not being specific. For example, have you ever sent a long email to a new contact without details on a proposed follow-up, request, or action item? If you are looking for an interview, are you clear with your request? Make sure your writing is concise, memorable, and typo-free. If you don’t get an answer to your email, do not give up. You might need to be more creative. In today’s social economy, technology has transformed how we network, connect and prospect for jobs. If you want to make Your Network Is Your Net Worth, don’t let your social capital lay dormant. Set an objective, build your online profile, develop partnerships to extend your reach and understand the basics of blogging. Get out there and use technology to accelerate and amplify your connecting efforts. Porter Gale is a start-up advisor, public speaker and former VP of Marketing at Virgin America. 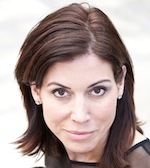 She is the author of Your Network Is Your Net Worth, a clear guide on how to bring value yourself and others through the powerful currency of relationships.